Canadian National Rail, homelessness, Vancouver B.C. Last November I mentioned CN Rail’s resolve to block homeless people from ever again camping on the grassy knoll beside its Burlington Northern rail yard in Sthrathcona by erecting a Trump-style border wall of concrete blocks along the east side of Glen Drive. 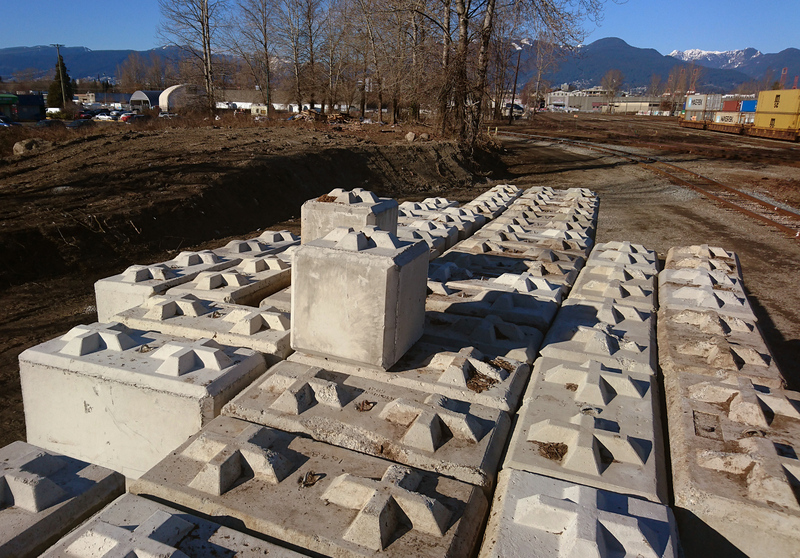 The concrete blocks needed to build that anti-homeless wall are now (as of March 4th) stacked neatly, just off the east end of Terminal Avenue, on the east Side of Glen Drive, within a stone’s throw of the 1st Avenue overpass. They may have been there for a few weeks already. The stack consists of at least 164 interlocking concrete blocks of the Lock-Block variety. Almost all are 1.5 metres long. Four of them, however, are half that width, or 0.762 metres square. 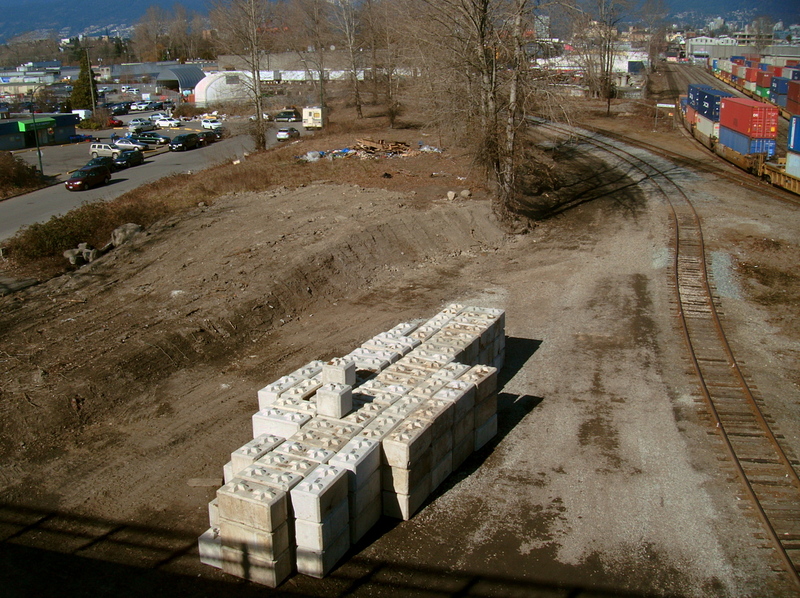 Only CN Rail knows exactly how the interlocking concrete blocks will be arranged. 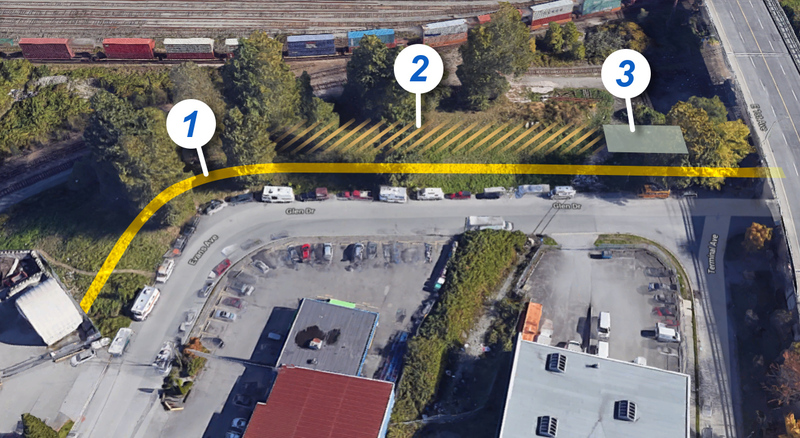 But, to form an effective barrier to would-be homeless campers, the blocks have to follow some part of a line that begins under the 1st Avenue overpass and runs north along the east side of Glen Drive. This line would end just around the elbow bend, where Glen becomes Evans Avenue and the path runs up to a fixed, Quonset-style building. Things as they are point plausibly to a wall that is two blocks high and pierced by an access gate. Such a wall would need the four half-width blocks that are in evidence and it would cover at least 130 metres of the maximum possible line, which measures no more than 164 metres. In addition to the blocks, it is obvious that CN Rail has used excavators to begin planing-off and flattening the slope along the south side of Glen Drive. The excavators and earlier city crews have all but removed any trace of the homeless camp that occupied the slope as recently as the middle of December. Some of the garbage piled at the elbow of Evans and Glen is all that remains of a homeless camp that lasted for months atop the slope. 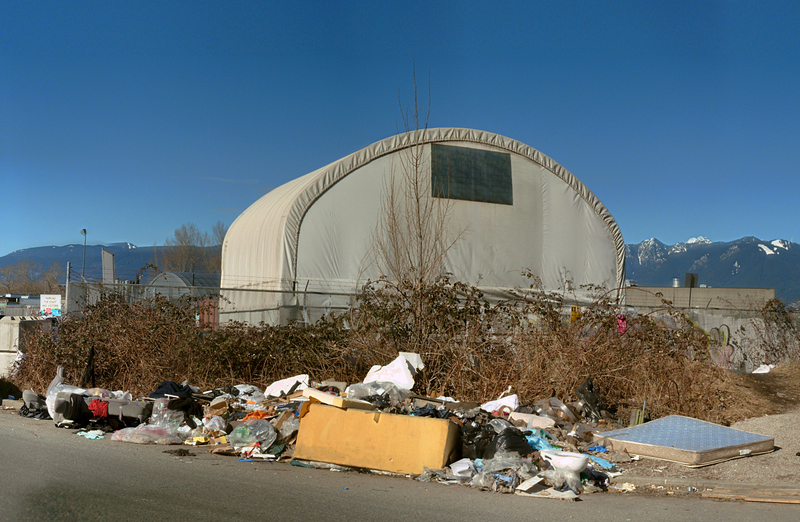 I am told by an eyewitness that a final effort to empty out the homeless camp beside Glen Drive was made on the morning of December 11th and that it involved an unspecified number of Vancouver police, a crew of perhaps 11 city workers and three dump trucks. By that time the camp was apparently occupied by no more than 12 homeless people. According to someone who watched the action unfold from a vantage point across the street at the recycling depot on the corner of Evans, two of the remaining campers—a man and a woman—appear to have been arrested by police. Two months later, all that remains of the campsite is a few wooden pallets on the slope and an unsightly pile of garbage located around the bend from Glen Drive, beside Evans Avenue. The trash—which includes a couch, at least one mattress and several rusted propane tanks—comes from both the former Glen Drive campsite and from elsewhere in the immediate, surrounding area. All of it, I am told, has been collected by the one remaining homeless person from the Glen Drive camp who has elected to stay in the area. Neither he nor any other homeless people were anywhere be seen in the area on Monday afternoon. There was just this one fellow sitting on a patch of the waste ground that borders a pedestrian path and flanks the CN Rail yard on the south side of Terminal Avenue. He had wedged himself among the many anti-rough sleeper boulders that were dropped by CN Rail workers in November. He was sitting on one of the boulders and playing a song on an acoustic guitar—reading from sheet music on a nickel-plated, collapsible music stand. Not too many metres away from him, though, there were unmistakable signs of homelessness. Recyclable remains of a small homeless camp, strewn about beside the CN rail yard. To the east were the remnants of a one-person encampment—cardboard and a paperback book—tossed all over the walkway. A regular in the area later told me that police had evicted the person and broken up his campsite. 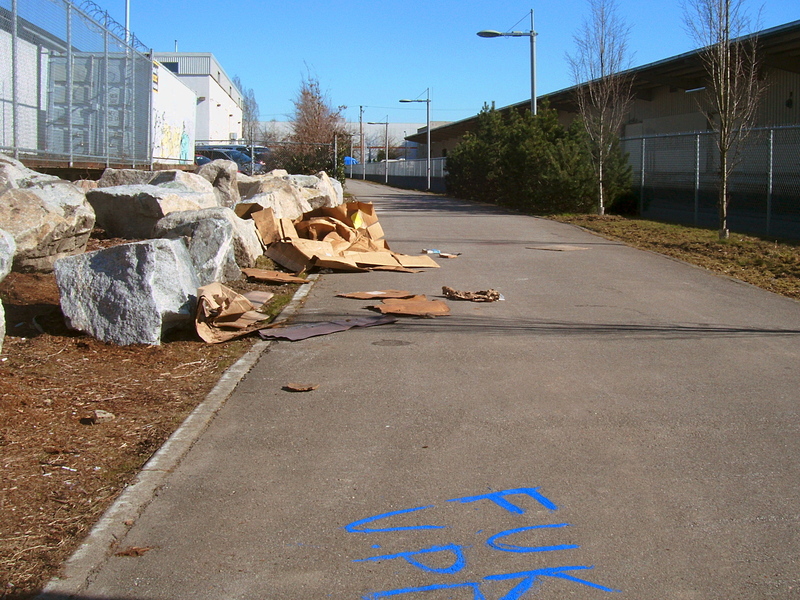 This may explain the “FUK VPD” graffiti that someone painted in blue on the walkway. 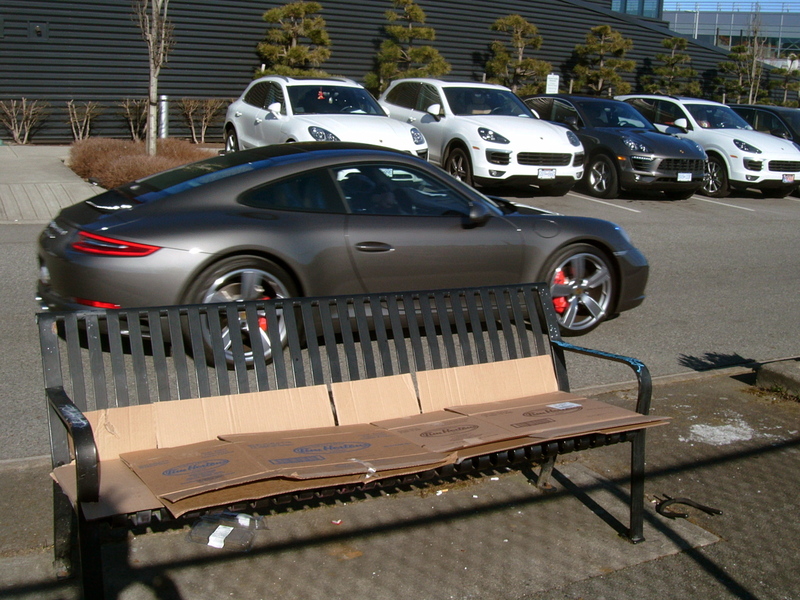 A sign that someone too destitute even for a poorhouse was sleeping rough in front of a Porsche-house!. Further west along the walkway—against the contrasting background of expensive sports cars parked behind the Porsche dealership in the 600 block of Terminal Avenue—pieces of cardboard laid over the seat of an enamelled steel bench gave evidence of recent rough sleeping. It was a terrible spot, without even the modest luxury of overhead cover or a windbreak (such as a wall of concrete blocks could provide, I thought). Anti-rough sleeping fixture and impromptu homeless message board off Cottrell Street and Terminal Avenue. On my way out of the area I noticed another—much more poignant sign—not just of homelessness but of hopelessness. This was located just around the corner from Glen Drive, back on Terminal Avenue, at the intersection with Cottrell Street. It was in a shallow alcove that offered both a modest degree of overhead cover and a windbreak. 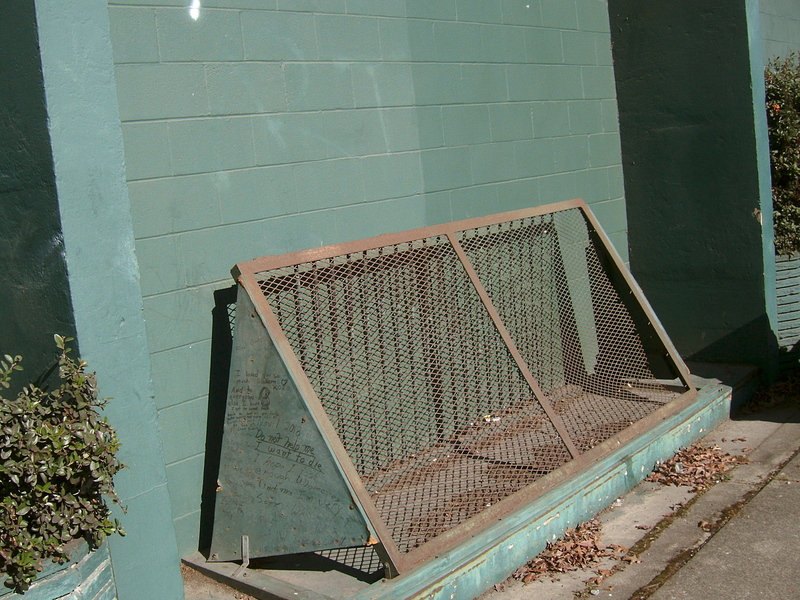 Or it would have, had it not been obstructed with a thing of green-painted angle iron, steel mesh and particle board, designed to stop homeless people from sleeping there. 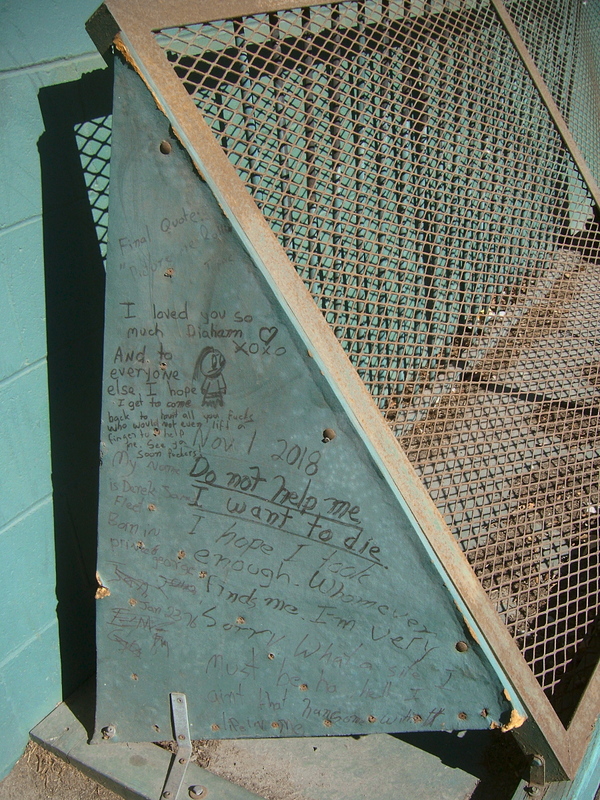 Deprived of a place to sleep, some homeless people used the painted particle board end of the obstruction as a place to write off their despair. This is depressing reading and it illustrates my belief that one of the worst dangers of homelessness is the hopelessness that can come with being stigmatized and marginalized and (dare I say it), walled-off by society. Because, when you think about it, what is stigma and prejudice but a kind of wall, or barrier to prevent a minority group from fully participating in society? And to the degree that you place any group of people apart and exclude them from complete social participation, I believe that you deprive them of equal opportunities and hope. The same is true whether we are talking about the homeless, or substance users, or the mentally ill, or the differently-abled, or people of colour—any visible minority group you can think of. It is only in hope that most people find the strength to cope with adversity. So we have to hope that all of these homeless message writers had their own hope to help them go on—that they either found it within themselves or through the positive intervention and support of friends, outreach workers, or even passing strangers. Click the images to enlarge them. A closer look at the depressingly repurposed anti-homeless feature. What a sad essay. When it comes to a company that is unkind to everything and everyone it touches youll have a hard time beating CN Rail. In my job I cross paths with the CN crew on Industrial and they are miserable unhappy and belligerent. Likely all have homes and make good wages so it seems that having a home doesnt equal happiness. I don’t doubt that there is good safety rationale for putting up a barrier. I wondered fifteen years ago why there wasn’t a chain link fence across the west side of the Burlington Northern rail yard. Non-railroad people have been walking around in there for years. But the impetus to do something now undeniably has to do with the overt homelessness in the area. Yes, another amazing post. It’s the hopelessness that crushes ME….. While people are proudly and “efficiently” flipping numbers around, for YEARS on end, can they not even notice THAT…… Nothing is changing….. Big studies, BIGGER money needed……. People wait and wait. Sure…. They are DAMN grateful when something finally happens then, great photo-ops. How absolutely heartless. BTW, people, look around your daily traveled routes and notice other things like Stanley has pointed out….. I do not feel hopeless, either for myself or for my homeless peers, at least not here in Vancouver, where some undeniably meaningful steps have been taken. There is the unarguable, sustained increase in emergency beds that occurred under Vision Vancouver and stands in stark contrast to the neglect of this elemental need that came before. This has been a benefit, albeit of the band-aid sort. And the last-minute rush to build temporary modular housing cannot be seen as anything but a positive — certainly in the short term. And it is an unfortunate misnomer to call this housing “temporary”, at least in Vancouver. It is built to last 40 years and the leases are. for the most part, for five years and an optional additional five years. Though they are being envisioned as three-year-stay transitional housing, those in the system, who are inclined to speak their mind, have admitted that in lieu of the permanent housing being built, occupancy, per-tenant, of these modular housing units will likely be much longer than three years. What can be said is that it is all too little and far, far too late. And, as is increasingly becoming apparent, the good news largely only applies to Vancouver. So many other communities in British Columbia (Maple Ridge, Abbotsford, Kelowna, Penticton — to name a few) are stubbornly dragging their feet, still pining for the days when they could use vagrancy laws to sweep undesirables off their streets and out of their communities.